Stir together all the ingredients for the cilantro lime sauce and refrigerate for an hour while you prepare the rest of the meal. Preheat the oven to 425 degrees and season both sides of the fish with salt and pepper. Once the oven is ready, place the cod fillets skin side down on a non-stick baking tray and bake for 8-15 minutes or until your desired finish. Heat up the tortillas in the microwave for 30 seconds. Cover the tortillas with a wet paper towel to keep them from getting dry. 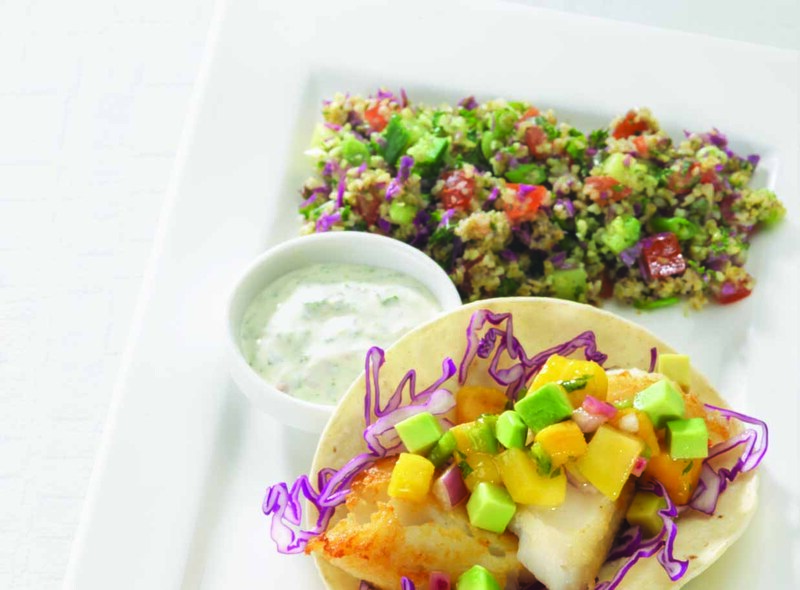 Place the cabbage and cod on the tortilla and layer on some avocado and spicy mango salsa. Finally, garnish with some cilantro chile lime sauce. Combine water and tabouli mix in a large bowl with olive oil, tomatoes, and kale. Let the mixture stand for 1 hour while it absorbs the water. After an hour, stir in the green onion and cucumber. Finally, season with some lemon juice and salt and pepper.